As we continue with the B1G Picture Series, our 3rd Q&A focuses on the Nebraska Cornhuskers. Mike Jaixen, Brandon Cavanaugh and Aaron Musfeldt from Corn Nation join us to discuss the ups and downs of their 2012 season, what to look for in 2013, conference realignment, and what they expect of the Cornhuskers and Badgers in 2013. BuckAround: Now that Nebraska has been fully immersed in the B1G for 2 years, how does this conference compare to the Big 12? Which brand of football do Nebraska fans enjoy watching more and why? What about different game venues? Mike Jaixen: My general take is that the middle/bottom of the B1G is stronger than the middle/bottom of the Big XII. Nobody in the B1G is a threat to win a national championship at this time, unlike the Big XII, mind you. (Yes, I see you Brutus...) Which is better? That’s a good question, and one that I really can’t answer. As for venues, I haven’t been on the road in a few years, but there is obviously some attraction to playing in Ann Arbor, Columbus, and yes, Madison. I’m not sure anybody is really intrigued by playing in Bloomington, but then again, we’re used to playing in Manhattan (Kansas). Brandon Cavanaugh: The immediate comparison is "all offense-no defense" (Big 12) versus ugly but powerful (B1G). While the former’s somewhat true and the latter definitely was last season, we’re seeing some transition in the Big Ten. I look at Ohio State, Michigan and Nebraska as teams who are adapting their own take on zone read principles while keeping their roots in a more traditional power run game. To me, the B1G has quite a few similarities to Nebraska’s stay in the Big 12, however the Big 12 South was somewhat more competitive than the current Leaders division. There’s Ohio State and everyone else right now. I don’t see that changing while Urban’s there. Also, with Penn State and Wisconsin up in the air, it’s hard to predict where the chips are going to fall. When it comes to what Nebraska fans as a whole like to watch, that’s a hard question to answer for me. I know so many people who are glued to their sets when the Huskers play, but don’t give other games a second look unless there’s some implications for Nebraska or overall (See: Alabama vs. Georgia last season). Then there’s the contingent that can’t get enough college football (*raises hand*). They dig MACtion, they’re watching the 11 AM kick, they’ve got five TVs rolling at tailgates or at home and if Hawaii’s playing, they don’t stop watching until about one or two in the morning. The venues all have their charm to me as these used to be non-conference games I wanted to see. Now it’s a yearly deal. The travel can be a pain. We saw that last year with fans having the option to fly to Los Angeles, Orlando and to all B1G away games. Aaron Musfeldt: The Big Ten has been a fun conference to be a part of. I feel like we are further away from everyone in the conference than we were in the Big XII, but we knew that when we signed up for the deal. Football is football, IMO. I’d be lying if i said I didn’t miss playing some of our old conference foes. BA: With all of the realignment talk, which teams do you think should be in the same division as Nebraska and why? What is your take on possibly moving to a 9 or 10-game conference schedule? MJ: Make it a geographic split please. East/West or North/South. Nebraska, Minnesota, Iowa, Wisconsin, Illinois, and Northwestern in one division. Add in Indiana, Purdue, or Michigan State if you please. As for the 9 or 10-game schedule, I hate the idea. Instead, B1G teams should be encouraged to schedule meaningful non-conference games against other BCS conference opponents. Without those non-conference matchups, we’ll never know whether the B1G is closing the gap with conferences like the SEC until bowl time. BC: Let’s say the Maryland and Rutgers merger goes through. Pitch the Legends and Leaders running gag and go West/East. West: Iowa, Illinois, Nebraska, Northwestern, Michigan State, Wisconsin. East: Indiana, Michigan, Ohio State, Purdue, Penn State, Rutgers. You’ve got your annual Buckeye-Wolverine battle, Nebraska-Wisconsin already has some bad blood and Nebraska-Iowa’s cooking, too. If Michigan-MSU must be protected, so be it. Nine or ten games in-conference? This is a businessman’s conference. Why is the idea of robbing its schools of money during the regular and postseason even an option? I subscribe to the same non-conference scheduling concept that so many do. Get a couple of patsies, a mid-tier team and a big boy, maybe two top 25-35 teams instead of the big boy and call it a day. Nebraska’s non-conference schedule next season isn’t great, but it’s one team away from being just right. It currently features Wyoming, Southern Miss, UCLA and South Dakota State. Boot SDSU for someone like Oklahoma (yes, Huskers miss the Sooners and can’t wait for 2020) or Texas (!) and voila. AM: It seems like they are going east/west. In principle, I like playing the schools that are closest to us every year, but an East/West B1G looks a lot like the Big XII North/South where you were top heavy on one side. BA: For someone who doesn't follow Nebraska football every day, what are the key position battles and storylines that they should follow for spring practice and into the fall for 2013? Is there anyone behind Ameer Abdullah that could be a force in the running game? MJ: The big position battles are on defense: Nebraska has huge holes on defense at safety, linebacker, and on the line. 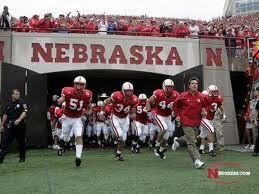 The "Blackshirts" will be more athletic, but less experienced in 2013. BC: Offensively, you’re going to mostly see familiar names. The offensive line is a work in progress right now. Bring out a dart board and you’ll get a depth chart just as accurate. The Huskers aren’t lacking for offensive playmakers. This is probably one of the best true wide receiver corps I’ve ever seen at Nebraska on tape or otherwise. I’ll get to defense in a second, but the running backs you’ll want to watch aside from Ameer are Imani Cross (a bruiser) and either Terrell Newby or Adam Taylor. Both will be true freshmen, very highly-touted out of California and Texas, respectively. Due to the current Braylon Heard situation, I suspect Newby avoids a redshirt as a speed back in a diamond scenario. BA: What about the “Blackshirts” defense? They looked dominant at times last season but at times looked porous in blowouts. What needs to be addressed specifically on the defensive side of the ball for Nebraska to be consistent on that side of the ball? BC: The Wisconsin game told you all you needed to know: Lack of sideline-to-sideline speed, lack of depth on the interior line and a secondary that struggled to make proper calls, especially at safety, the most important position in Pelini’s defense. Nebraska needs to work from the interior line and move out, then back. Finding a solid two-deep for tackles should be interesting. Keep an eye out for a redshirt freshman named Vincent Valentine. The defensive ends should be fine. The linebacker position is stacked, but young. I’ve found that athleticism can sometimes make up for inexperience, but mistakes are still going to be made. That said, there are some truly gifted B1G-style linebackers in that crew. If the DL can’t contain, linebackers may be able to clean things up a little earlier this season. Looking at the secondary, this is the spot that needs to be addressed the most. As I said, if you can’t make reads, you can’t play safety for Bo Pelini. That’s why you’ve seen guys that may not be burners at FS and SS back there, but they’re some of the smartest guys on the team. We’ll see who steps up. BA: Much has been said – good and bad – about QB Taylor Martinez taking Nebraska to the next level. Do you believe he is capable of winning a conference championship and a BCS game? Is he a legit 2013 Heisman Trophy candidate? MJ: This question will split the fan base. Personally, I think he can do just that. He’s grown and improved each season, and frankly, he saved Nebraska’s bacon multiple times over the years. But he does have the tendency to turn the ball over, and until that changes, he’s going to have his critics. BC: I think he is capable, however as a redshirt junior, he’s still having what I’ve referred to as “Superman Moments” when he thinks he has to do it all. The best thing for Taylor is to let his teammates help him. Simple, right? He had big numbers last year, so something surely clicked. Well, yes and no. Taylor was very accurate when throwing behind the line of scrimmage up until about a 14-yard toss, but beyond that, the water got choppy. Thank California-based quarterback coach Steve Calhoun and offensive coordinator Tim Beck for his improvement. His progress aside, is he going to take Nebraska to a conference championship? Never say never, but assuming Ohio State lines up across from the Huskers, I wouldn’t count on it. Stranger things have happened, though, right? If Nebraska can plunk the rest of their schedule, I could see the Big Red as an at-large BCS bid, but as of right now, I can’t say Meyer won’t win the B1G title that he would’ve won last year. Is Martinez a Heisman candidate? No. The offense relies on all 11 members to function. If he could improvise on the fly in a more positive manner consistently, then you’ve got a contender. AM: Taylor played well last year. He gets a lot of flack but when he visits 5 years after he graduates, people will treat him like a conquering hero. Honestly, if he could just cut the fumbles down, I don’t see why he couldn’t get a conference title or an invite to New York City. A couple more mediocre seasons and Bo Pelini may find himself on the hot seat in Lincoln. BA: Is Bo Pelini the man that can win a national title at Nebraska? What is the feeling about him in Lincoln? What is his ceiling? Have we seen it? MJ: And again, this will split fans. Most fans are still behind Pelini, I think. But there is a growing contingent of fans who are upset with his past sideline behavior and the repeated bad losses. The longer that continues, the worse it is for Pelini. BC: Can he? Sure. Will he? It’s hard to say. The resources are there for him to embrace anything an SEC program can pump out, recruiting staffs for example. His personality’s always been a sticking point. I mean come on, there’s a reason everyone pointed out that Bo Pelini was getting in on the recent Harlem Shake video. That said, it doesn’t look good when you say you didn’t forget how to coach defense and then get lit up for 70 points. Like I said, Pelini’s got all of the tools to contend. Has he hit his ceiling? I think he’s capable of far more than we’ve seen. Will that change? That’s the $64,000 question. AM: Pelini has to keep learning. At times he seems very stubborn and prideful, but if he adjusts and can make the tough changes when they are needed then yes he can be successful. BA: Moving on to Wisconsin, what is the image of Wisconsin – both as a fan base and a football team – amongst Huskers fans? Does the arrival of Gary Andersen change this at all? BC: Oh, you want me to slam the students, huh? They’ve got their chant and that’s fine. I love the Jump Around moment. As a football team, the slate’s been wiped clean with Andersen. I think he’s a great hire and bringing former Nebraska secondary coach Bill Busch was a fantastic move. He may not be the best coach in the world, but he’s instantly one of the best recruiters in the Big Ten. Truth be told, I doubt the Huskers’ brass would mind poaching him to help out with recruiting behind the scenes a la Kevin Steele at Alabama. AM: I’ve only interacted with a few Wisconsin fans. Most are cordial, but, like any place, you have your 20-year-olds that act like 20-year-olds. My image of the football program is that they build a solid team every year. BA: Wisconsin and Nebraska have formed a nice little rivalry in the last 2 seasons playing each other 3 times and with the Barry Alvarez-Nebraska connection. Do you see this rivalry continuing to grow, divisional realignment notwithstanding? BC: Absolutely, and I am so on board with this. Nebraska-Wisconsin was actually a series I was very excited about seeing when the expansion was announced, especially with the history you mentioned. Give this game a decade. I think you may see something close to a blood feud. AM: To be honest, I feel like Nebraska-Wisconsin is being forced down my throat. First B1G game. Special uniforms for both football and basketball. Hearing about Barry every time they play. I grew up in Omaha and have family in Iowa and MInnesota. If we end up in the same division, and you don’t blow us out every year, then maybe I’ll be more interested in Wisconsin. BA: What is your take on Bret Bielema's surprise departure to Arkansas? Is this part of the larger SEC-as-the-dominant-conference narrative or something else? Who is the coaching villain now that Bielema is gone? BC: He wanted to get paid, Arkansas wanted to be relevant again in a hurry, had their checkbooks open and Bret’s gotten results. Business is business. The new coaching villain? Oh yeah, like you have to ask. Admittedly, I can admire how guys like Meyer and Saban operate. There’s a very business-like attitude to what they do. Pelini’s players like him, but so do Meyer’s and Saban’s. Despite a very business-like approach, these programs understand what they do pays dividends. Alabama has a chance to make history and Ohio State may stand in their way. Bottom line, unless a coach has done something borderline if not entirely criminal, it’s hard to look at them as a villain and not a punchline. AM: I think it was a mistake on his part. Time will tell, but I don’t think he will really fit in with the “Pig-Souie” crowd. BA: Thanks for your time guys! Mike Jaixen, Brandon Cavanaugh and Aaron Musfeldt are all writers at Corn Nation. Mike and Brandon can both be found on Twitter. Posted in The B1G Picture and tagged with Bo Pelini, Taylor Martinez, Ameer Abdullah, Blackshirts. March 13, 2013 by Buckaround.